Nancy Droukas, CPDT-KA, CNWI is the President of Performance Plus Dog Training Inc. She has been training and showing dogs since 1992. She has achieved numerous titles and awards in the United States and Canada. Her first competition dog was a 5 pound Yorkshire Terrier named Biscuit with whom she achieved a Utility Dog (UD) title…no easy feat, to be sure, but very educational. That training experience laid the foundation for her do no harm training philosophy and motivational techniques. She went on to achieve an Obedience Trial Champion (OTCh) title on her rescued Labrador Retriever, Abby, and has since put an OTCh on two of her Golden Retrievers, Dash and Chance. 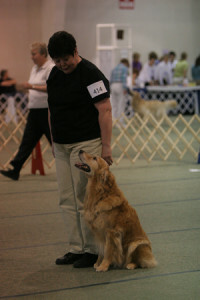 Her third Golden Retriever, Twist, earned his Utility Dog title (UD) in November, 2008 and in January 2009 due to the demands of the business he was retired with 25 OTCh points and his Utility wins. Her fourth, fifth, sixth, seventh and eighth Golden Retrievers, Grip, Grab, Reason, Gimme and Goody are works in progress and won’t be ready for competition for awhile. Nancy is also a member of the 200 Club. Membership in this club is attained when a judge awards the team a perfect score (200) for their performance. Nancy has several 200’s to her credit. Nancy has also done a bit of retriever field training at an amateur level and has put Junior Hunter (JH) titles and Working Certificate Excellent (WCX) titles on Dash, Chance, Twist and Grip. Her latest endeavor is K9 Nose Work. She is a Certified Nose Work Instructor (CNWI). 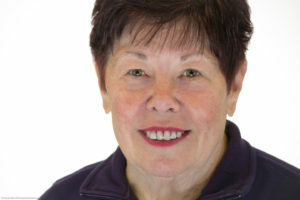 To date she has achieved four NW1 titles, three NW2 titles, two NW3 titles, one NW3 Elite title on her dogs, as well as helping her students achieve numerous titles on their dogs. Grab is training for NW3 Elite and Reason is training for NW3. Grip went from an NW2 to an NW3 Elite in 6 tries. The average is about 11 tries. Achieving an NW3 Elite title is very similar to achieving an OTCh title in competition obedience. Nancy has an insatiable appetite for learning. She finds training for this new sport very exciting and invigorating. She brings her enthusiasm and knowledge to the classroom and inspires her students to embrace the time they spend training their dog no matter what the venue. Nancy’s passion for dog training and pursuit of excellence along with her good humor has given birth to a premier training facility which offers something for everyone no matter what their level of expertise. From the seasoned trainer to the first time dog owner, all are welcomed at Performance Plus K9 Activity Center – a warm, friendly, FUN place to effectively train your dog and learn to build a strong, balanced relationship. Click here to see pictures of Nancy’s Dogs.